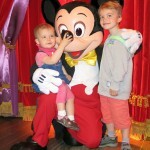 After nearly one year and one hour of waiting there he was, Mickey Mouse himself, giving my son the long awaited hug. Tristan had been asking us to go and visit Mickey Mouse and all of his other Disney friends for a very long time and we told him to keep dreaming about it and that one day it will happen. Then one day my husband found an offer for a 4 day stay at half price which made the trip affordable and so we did not hesitate and booked. 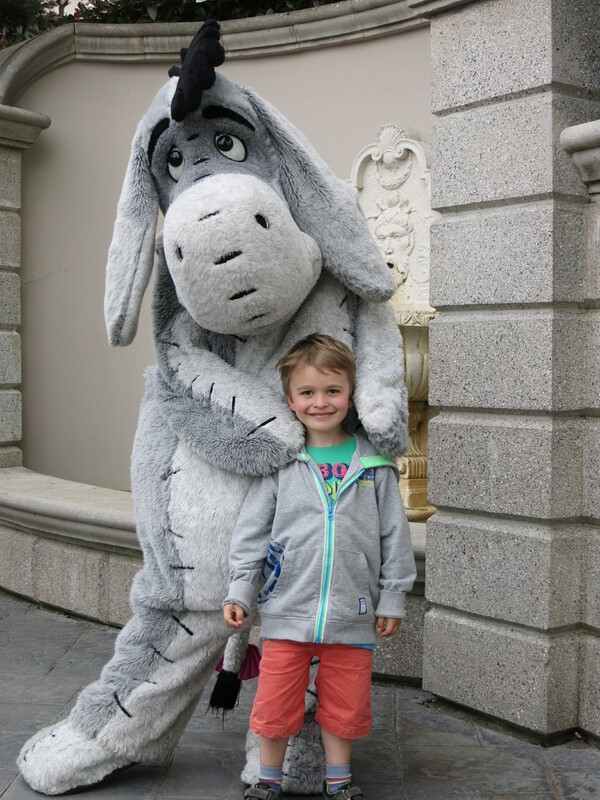 We had an absolutely amazing time and Tristan was over the moon with seeing so many of his friends and getting hugs from not only Mickey but also from Eeyore and Goofy. Briana was so excited that she hardly napped. We went on our trip without any tips from anyone who had been there before and I have learned a few things that would have been valuable to know before leaving. So I decided to share these things with you and maybe they’ll come in handy one day. As we went by car and stayed in the Disney’s Davy Crockett Ranch some of the tips are specific to that, however, most tips are pretty general. 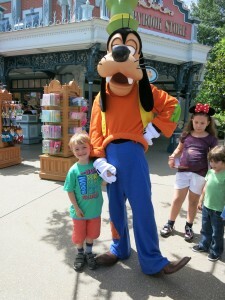 The package we booked included 4 days at Disneyland including parking and 3 nights at the Ranch. We definitely recommend to have at least 2 full days and one half day at the park, you can easily fill more days and still not have seen everything. We used our first day to travel to Paris and to get some food shopping done and did not make it to the park. See my recommendations for food/meals which may make a first trip to the park on the day of arrival possibile. If you can avoid it, I would recommend not to go with a child who still takes naps. Nearly all of the attractions require you to leave your stroller outside, so if your child naps, there is not much you can do as a family. Of course you can always take turns. I would also recommend to wait until at least your oldest child is old enough to remember the experience. You can rent a stroller, I’m not sure they are suitable for children who still nap as I don’t know if they recline. I would recommend renting a stroller even if you don’t need it for your child(ren) it’s very handy for any extra jackets, bags, lunch, etc. As you need to leave strollers at the entrance of every attraction make sure you have a small bag you can carry with you at all times for wallet, camera and possibly something to drink as you might be waiting for a long time before you get back to your stroller. There is at least one baby corner which is about the only place that is a little quiet. It has a microwave, small tables and chairs, a family toilet and lots of nappy changing space. If you are like me and you like your kids to have clean hands when they eat, definitely take some baby wipes even if you don’t have a baby anymore. Remember to take sun cream at hats when it’s sunny. In case of rain I’m not actually sure what the best thing to do would be. I’m thinking of light weight rain coats (the kind that fold up into a small pouch) but when it rains all of the outside attractions will be wet too; there are rides that are completely covered though. If you have a daughter who likes to wear princess dresses or might want one when she sees one; I recommend you take a dress from home and have her wear it to the park. If you don’t have one you could even make it a surprise. This will avoid your daughter begging you for one of the dresses sold in the park which no doubt are as overpriced as everything else. You do see a few boys dressed up too and they generally wear pirate costumes. If you are staying at the Ranch there is a shop there – see comments under Disney’s Davy Crockett Ranch. Carrefour at 10 min drive from the Ranch; we love shopping at the French mega stores because even compared to the wonderful Belgian supermarkets (which are paradise when you come from a small German town) they are amazing in their selection. The problem is that you can waist loads of time in a shop of that size when you don’t know where to find what you are looking for. If you decide to shop there, I can recommend the take-away sushi section. It’s delicious and does not even need heating up. For evening meals the easiest is to bring food that can easily be heated in the microwave or in a pan (anything that does not involve cutting as there are no cooking knives). If you have a toastie maker, that might make for a great alternative to microwave food. For breakfast the shop on the Ranch is ok, you can get baguette, croissants and chocolate croissants (we always bought extra chocolate croissants to take along for during the day). We chose to stay at the Ranch for the convenience of having a kitchen with fridge and microwave which allowed us to prepare our own food and easily heat up milk for our daughter. Baby bed (which is a travel cot) can be asked for, no sheets are provided for the small fold up mattress. Even though we had asked for a baby bed, there was no high chair when we arrived, so be sure to ask for that explicitly if you need one. The travel cot only fits comfortably in the living/dining room area. We moved a bed side table, pushed the double bed over and managed to squeeze the cot next to it so that our daughter could go to sleep while we were still up. No small cutlery available other than tea spoons, in fact the forks were the most giant forks I have ever seen and I would have brought cutlery for both of my children had I known. If you have been to Disneyland Paris already, I would like to invite you to add your tips to this list. Maybe you can recommend another accommodation? If you have not been there yet, I would love to hear if you are finding this information useful and if you do, don’t hesitate to share it with others.